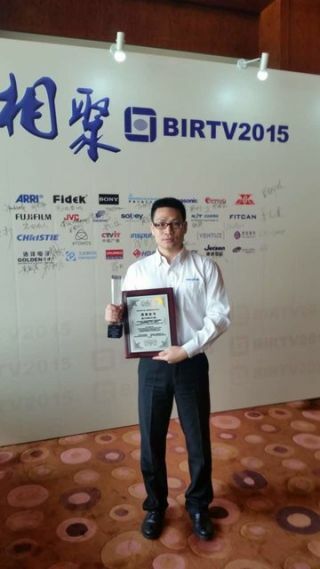 Christie is the recipient of the BIRTV Award for the Christie 6-Primary laser projection system at the 2015 Beijing International Radio, TV & Film Equipment Exhibition. The BIRTV awards program is an award given out in the digital cinema industry. Winners are selected by a panel of industry experts according to rigorous and objective standards. The judging panel praised Christie’s laser projection technology as a superior 3D cinema experience for all movie-goers. Anchored by the Christie Freedom laser illumination system, the Christie CP42LH 6P laser projector can produce brightness levels up to 60,000 lumens and a color gamut that exceeds the DCI P3 color and replicates the Rec. 2020 space. A fiber cable connects the laser light source with the projection head, the complete laser projection system is engineered to produce high brightness levels and color utilizing a high bit depth 4K resolution imaging engine. The result is improved 3D light levels, image uniformity, viewing comfort, and an enhanced sense of immersion. Shuai Zhen, Christie China senior sales manager, with the award trophy and certificateShuai Zhen, senior sales manager (Entertainment Solutions), Christie China, was presented with the BIRTV Award during the awards presentation ceremony held at the Conference Hall of Beijing International Hotel on August 25. The event was attended by more than 300 representatives from China’s radio, television and film industries. Christie’s 6P laser projection system has been installed in numerous premium large format theaters worldwide. In China, a 6P laser projector has been fitted in Hall 1 of the prestigious Shanghai Film Art Center where audiences are able to get a 3D movie-viewing experience on the 23-meter Oriental Mega Screen.